57850 Driver Charles Patrick Aggett of the 99th Brigade, the Royal Field Artillery.Son of the late James and Susannah Aggett of Chudleigh. Born in 1891. Born in 1891. Died 27 February 1917 aged 26. Buried in Greece. 10416 Private Frederick Samuel Blackmore of the 8th Battalion, the Devonshire Regiment. Son of Samuel and Mary Blackmore of Clifford St.,Chudleigh; husband of Amy Blackmore, also of Clifford St., Chudleigh. Born in Chudleigh in the March Quarter of 1892. Died 31 October 1918 aged 27. 19247 Sergeant Horace William Bond of "H" Coy.,3rd Battalion, Sappers and Miners, the Royal Engineers. Son of James and Mary Ann Bond on of 33 Clifford Street, Chudleigh. Born in Chudleigh in the December Quarter of 1891. Died 11 August 1917 aged 25. 4433 Private Leonard Bowden of the Machine Gun Corps (Infantry; formerly 18308 of the Devonshire Regiment. Son of Charles and Susan Bowden of Exeter Street, Chudleigh. Born in Chudleigh in the June Quarter of 1888. Died 14 October 1917 aged 29. 30539 Staff Sergeant Frederick George Boxall of the 75th Field Ambulance, the Royal Army Medical Corps. Born in Petworth, Sussex in 1880. Died 11 April 1918 aged 38. Awarded the Military Medal for bravery and the Meritorious Service Medal for devotion to duty. 15326 Private John Henry Bradford of the 9th Battalion, the Devonshire Regiment. Son of John and Elizabeth Bradford. Born near Shobrooke in 1886. Died 1 July 1916 aged 30. Worked at Palace Farm, Chudleigh. 8017 Private Edwin John Caunter of the 1st Battalion, the Duke of Cornwall's Light Infantry. Son of Edwin and Fanny Caunter of Woodway Street, Chudleigh. Born in Chudleigh in the December Quarter of 1885. Died 18 September 1914 aged 28. 5608348 Private Frederick Cleave of the 1st Battalion, the Devonshire Regiment. Son of Charles John and Eva Cleave (nëe Nixon). Born in Chudleigh in the March Quarter of 1899. Died 6 January 1921 aged 20. Buried in the cemetery at Chudleigh. 241936 Lance Corporal Sydney John Cobley of the 2nd/ 8th battalion, the Worcestershire Regiment. Son of Sydney and Patience Cobley. Born in Chudleigh in 1899. Died 27 August 1917 aged 18. We have included Thomas because no other person of this surname (however spelt) can be found currently in military records. We can find no connection with Chudleigh for him as yet. 24333 Private Thomas Cornall of the Somerset Light Infantry; transferred to the 696th Agricultural Company. Son of Thomas and Elizabeth Cornall; husband of Bertha Cornall of Spring Gardens, Chudleigh. Born in Kingsteignton in the March Quarter of 1879. Died 18 January 1919 aged 40. 285228 Private Percy Ivor Critchley of the 2nd/1st Bucks Battalion, the Ox and Bucks Light Infantry; formerly 30374 of the Devonshire Regiment. Parents not known. He was born in Chudleigh in 1899 and fostered out as a child. Died 6 December 1917 aged 18. PLY/17712 Private Frederick Francis Down of the Royal Marine Light Infantry. Son of William and Sarah Down of Ideford. Born in Kingsteignton 15 November 1897. Died 11 April 1916 aged 19. Buried in Chudleigh Cemtery. 16099 Lance Sergeant James Eagles of the 1st Battalion, the Devonshire Regiment. Adopted son of Robert and Elizabeth Eagles. Born in Northfield, Buckinghamshire in 1892. Died 24 November 1916 aged 24. Lieutenant Rupert Farquhar, the 4th Battalion, the Grenadier Guards. Son of Ernest and Maria Farquhar of "Whiteway", Chudleigh. Born in London in the September Quarter of 1897. Died 17 September 1917 aged 20. 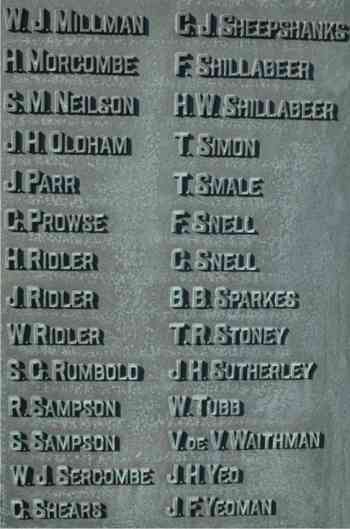 Awarded the MIlitary Cross for bravery in action on 15th and 25th of September 1916. 15289 Private John Perdy French of the 1st Battalion, the Devonshire Regiment. Son of William and Sarah French of Ideford. 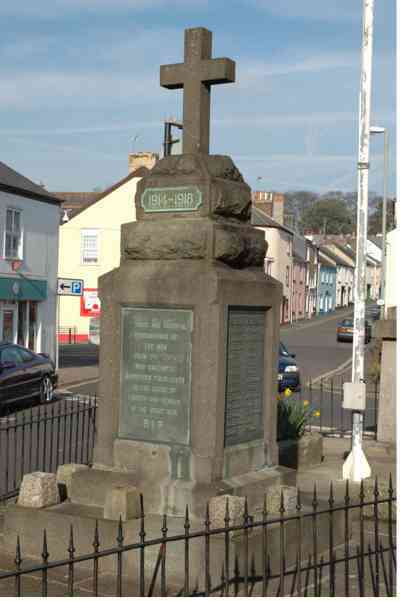 Born in Honiton in 1885. Died 23 April 1917 aged 32. 17090 Private Frederick George White Gill of the 9th Battalion, the Devonshire Regiment. Son of Edwin and Annie Gill. Born in Chudleigh in the March Quarter of 1898. Died 6 September 1916 aged 18. 43837Rifleman Henjamin Hassey Glass of the 1st Battalion, the Royal Irish Fusiliers. Son of Thomas and Mary Ann Glass of Old Exeter Street, Chudleigh. Born in Chudleigh in 1883. Died 20 February 1917 aged 34. 1251 Corporal John Adams Grant of the 1st/ 5th Battalion, the Devonshire Regiment. Son of George and Mary Jane Grant of Old Exeter Street, Chudleigh. Born in Shobrooke, Devon, in 1890. Died 4 July 1916 aged 26. 19172 Private John H Greenhouse of the 10th (Service) Battalion, the Devonshire Regiment. Husband of Emma Greenhouse of Old Exeter Street, Chudleigh. Born in Ludlow in 1881. Died 15 August 1918 aged 36. 240123Private Wilfred Hammacott of the 3rd Battalion, the Devonshire Regiment. Son of John and Sarah Hammacott of Clifford Street, Chudleigh. Born in Chudleigh in the March Quarter of 1887. Died 1 April 1920 aged 33. Buried in Chudleigh Cemetery. 9100 Bandsman John Thomas horton of the 1st Battalion, the Connaught Rangers. Parents not yet known. ; brother of Ethel Horton of the Hospital, East Street, Newton Abbot. Born in Totnes in 1892, Died 20 December 1914 aged 22. 16526 Private Ernest Knight of the 9th Battalion, the Devonshire Regiment. Son of Frank and Sarah Knight of Mission Road, Chudleigh. Born in Chudleigh in 1896. Died 1 July 1916 aged 20. K/32651 Stoker 1st Class Alfred Henry Lambell of the Royal Navy, HMS Tornado. Son of James and Emily Lambell of 19 Woodway Street, Chudleigh. Born in Heathfield Near Bovey Tracey in 1899. Died 23 December 1917 aged 19. 5630 Drummer William Henry Leach of the 1st/4th Battalion (Territorials), the Devonshire Regiment. Son of William and Martha Leach of Old Exeter Street, Chudleigh. Born in Devonport in 1899. Died 3 February 1917 aged 18. 8926 Acting Corporal Arthur Henry Lethbridge of the 1st Battalion, the Devonshire Regiment. Son of John and Emma Lethbridge. Born in Chudleigh in 1891. Died 21 july 1916 aged 25. Captain John Cole McMurdo of the 1st Battalion, the Essex Regiment. Son of Mrs Fanny McMurdo and the late Commander Aston McMurdo of the Royal Navy; brother of Robert (see below). Born in Alverstoke, Hants, in the December Quarter of 1884. Died 25 April 1915 aged 31. A/36230 Private Robert McMurdo of the 4th Battalion, the Canadian Infantry (Central Ontario Regiment). Son of Mrs Fanny McMurdo and the late Commander Aston McMurdo of the Royal Navy; brother of John (as above). Born in Sheerness, Kent in 1892. Died 14 June 1916 aged 24. 3/7183 Private Gilbert Metters of the 8th Battalion, the devonshire Regiment. Son of William and Emma Metters lately of Pottery Lane, Chudleigh. Born in Linkenshorne, Cornwall in 1886. Died 4 November 1914 aged 29 at home. Buried in Chudleigh Cemetery. 30045 Private William Miller of the Somerset Light infantry; formerly 1462 in the Devonshire Regiment. Son of Samuel and Emily Miller. Born in 1895. Died 10 April 1917 aged 22. 240085 Lance Corporal Thomas Geogre Millman of the 1st/5th Battalion, the Devonshire Regiment. Son of Thomas and Maria Millman. Born in Chudleigh in the June Quarter of 1886. Died 30 September 1918 aged 30. 5707 Sergeant Reginald Jordan of the 13th Battalion, the Royal Fusiliers. Son of Emily Hall of Chudleigh. Born in Chudleigh in the September Quarter of 1893. Died 11 April 1917 aged 23. 2nd Lieutenant Somerville Montgomerie Neilson of the 3rd Battalion, the Devonshire Regiment, attached to the 1st Battalion. Son of the late Matthew and Mary Neilson of "Evelaw", Chudleigh. Died 14 April 1917 aged 30. 2nd Lieutenant John Haslope Oldham of the 3rd Battalion, the Duke of Cornwall's Light Infantry; sttached to the 2nd Battalion, the King's Own Yorkshire Light Infantry. Son of Alice Oldham of "Oakfields," Chudleigh and the late Ernest Oldham. Born in Southgate, Middlesex 7 January 1891. Died 18 April 1915 aged 24. 26777 Private James Parr of the 9th Battalion, the Devonshire Regiment. Son of Francis and Ann Parr; husband of Mary Rawlings (formerly Parr) of New Exeter Street. Born in Ashreigney in 1879. Died 26 October 1917 aged 38. 2957 Lance Corporal George Scott Prowse of the 10th Hussars, the Household Cavalary. Son of Emanuel and Emma Prowse. Born in Chudleigh in 1886. Died 31 October 1914 aged 28. M2/167917 Private Henry Ridler of the Royal Army Service Corps. Son of Henry and Mary Ridler. Born in Chudleigh in 1886. Died 26 August 1916 aged 30. 169197 Ordinary Seaman John Ridler of HMS Vivid (Shore base). Son of Thomas and Eliza of harcombe Village, Chudleigh. Born in Chudleigh 20 April 1877. Died of illness 12 April 1917 aged 40. Buried in Ford Park Cemetery, Plymouth. 78 Coproral Willis Ridler of the 22nd (Wessex and Welsh) Territorial Battalion, the Rifle Brigade, formerly of the 6th Devons. Son of William and Mary Ridler of Clifford Street; husband of Olive Ridler. Born in Chudleigh in the December Quarter of 1878. Died 28 April 1916 aged 38. 241944 Sydney Gordon Rumbold of the 1st/5th Battalion, the Gloucestershire Regiment. Son of Sydney and Harriet Rimbold of Charfield, Gloucester; husband of Florence Rumbold of Haytor View, Chudleigh. Born in Gloucester in 1892. Died 2 February 1917 aged 25. 204579 Private Reginald Sampson of the 1st Battalion, the Hampshire Regiment. Son of William and Mary Jane Sampson; husband of Violet Maud Sampson of Clifford Street, Chudleigh. Born in Chudleigh in 1893. Died 22 September 1917 aged 24. 4748 Private Sydney James Sampson of the 1st/6th Battalion, the Devonshire Regiment. Son of James Samspon and the late Selma Sampson. Born in Trusham in 1898. Died 7 October 1916 aged 18. 163215 Chief petty Officer William John Sercombe of HMS Severn. Son of William Sercombe and the late Emma Sercombe. Born in Dunsford in the June Quarter of 1885. Worked in Chudleigh before he joined the Navy. He was awarded the DSM for his bravery and skill in the battle of Heligoland when he was played a leading part in in the sinking of the German Cruiser Königsberg.in July 1915. Captain Charles John Harcourt Sheepshanks of the 8th Battalion, the Devonshire Regiment. Son of the Rev. Thomas Sheepshanks and his wife Julia of Stokelake House, Chudleigh. Born in Harrogate. Torkshire in 1888. Died 17 March 1916 aged 28. PLY 17538 Private Frederick Shillabeer of the 2nd Royal Naval Battalion, the Royal Naval Division, the Royal Marine Light Infantry. Son of James and Emma Shillabeer of Old Exeter Street; brother of (below). Born in Chudleigh 24 April 1897. Died 22 July 1916 aged 19. 29636 Sergeant William Shillabeer of 110 |Brigade, the Royal Garrison Artillery. Son of James and Emma Shillabeer. Born in Chudleigh in 1884. Died 25 November 1916 aged 32. Awarded the Sultan's Sudan Medal. 3/7181 Lance Corporal Thomas Edward Simon of the 9th battalion, the Devonshire Regiment. Brother of J. H. Simon of teignmouth. Born in Kenton in 1876. Died 14 November 1915 aged 39. 9928 Private Thomas Smales of the Coldstream Guards. Son of William and Maria of Wapperwell. Born in Chudleigh in 1894. Died 27 October 1914 aged 20. 61945 Private Frank Snell of 84 Field Coy, the Royal Engineers. Son of George and Ellen Snell of Clifford Street, Chudleigh; brother of George (see below). Born in Chudleigh in 1895. Died 22 July 1915 aged 20. 345085 Corporal George Snell of the Royal 1st Devon Yeomanry and the Royal North Devon Battalion, the Devonshire Regiment. Son of George and Ellen Snell of Clifford Street, Chudleigh; brother of Frank (above). Born in Chudleigh in 1892. Died 10 September 1918 aged 26. 629047 Private Bernard Basil Sparkes of the 47th Battalion, the Canadian infantry (British Colombia Regiment). Parents not known. Brought up by Grandparents John and Mary Ann Sparkes of Fore Street, Chudleigh. Born in Chudleigh 2 May 1896. Died 6 November 1916 aged 20. 2nd Lieutenant (Adjutant) Thomas Ramsey Stoney of the 3rd Battalion and the 6th Battalion, the King's Own Scottish Borderers. Son of George and Meylia Stoney; husband of Dorothy Stoney of Stonelake House, Chudleigh. Born in Dungarvan County, Ireland. Died 10 April 1918 aged 35. 29964 Lance Corporal James henry Sutherley of the 8th Battalion, Prince Albert's Regiment (Somerset Light Infantry). Son of John and Mary Sutherley of Fore Street, Chudleigh. Born in Chudleigh in 1894. Died 31 July 1917 aged 23. 201247 Private William Tubbs of the 1st Battalion, the London Regiment (Royal Fusiliers). Son of John and Jane Tubb. Born in Marystowe in 1872. Died 22 May 1917 aged 45. He was Chudleigh's Bible Christian Minister. Private Victor da Vipont Waithman of the 9th Battalion, the King's own Regiment (the Lancaste Regiment). Son of Joseph Waithman of Hurst View, Chudleigh and the late Eugenie Waithman. Born in London in the June Quarter of 1897. Died 21 April 1918 aged 20. J4882 Leading Seaman John Henry Yeo of the Royal Navy, HMS Tiger. Son of Henry and Alice Yeo of Gappah, nr. Chudleigh. Born in Gappah 23 February 1894. Died 31 May 1916 aged 21. 2693 Sapper Joseph Frederick Yeoman of the 1st/3rd (Wessex) Field Coy, the Royal Engineers. Son of William and Mary Ann Yeoman. Born in Totnes in the March Quarter of 1881. Died 5 March 1916 aged 35.